Here the Favelas have historically struggled against the Brazilian government for the right to receive even basic civic services like sanitation and trash collection and are often victims of innaccurate or misleading reporting by Brazil’s mainstream media. 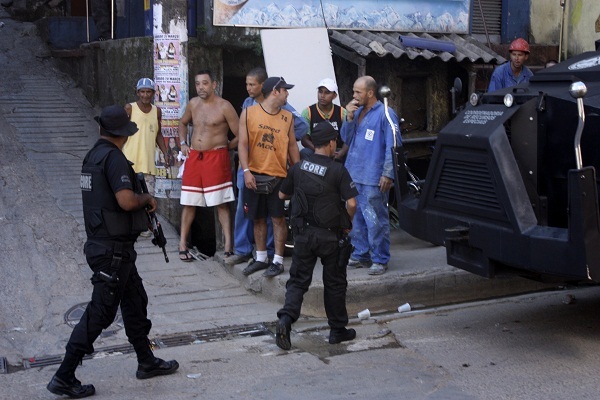 This I witnessed with my own eyes on the 15th of March, 2010 when 80 heavily-armed and violent military police called the BOPE invaded the Favela Rocinha, home to over 100,000 people, as a test run for its military pacification program during the lead up to the world cup. What happened on the ground was not what was broadcast on TV. A large crowd of Rocinha locals gathered at the bottom of Cachopa Street and chanted: “Policía Roba!” Police Steal! They were ignored by the embedded Brazilian media, being escorted by the BOPE, whose report that night on TV featured only residents who welcomed military pacification with open arms. The BOPE however did not ignore the zoom-lense camera I carried and approached me to ask my name and nationality, my reason for being in Rocinha, what Visa I used to enter Brazil, and whether I was a journalist (I told them I wasn’t) and wrote it all down in a little black book before ordering me back to my apartment. Until that day I had always felt safe as a foreigner living in Rocinha which was then controlled by the bandido drug gang Amigos dos Amigos. I almost always left my apartment in the sector of Paulo Brito unlocked because common crime was extremely rare and I was unaware it’s illegal for BOPE to enter a home without a warrant except in the Favela. As I loaded the photos of the BOPE onto my laptop I wondered what makes someone a “journalist” and if I could honestly call myself one having studied Network Engineering over a more relevent field. It was then that two BOPE in black flak jackets and balaclavas silently entered my apartment then screamed at me to hold my hands in the air while pointing their machine guns at my head. They were only there to scare. 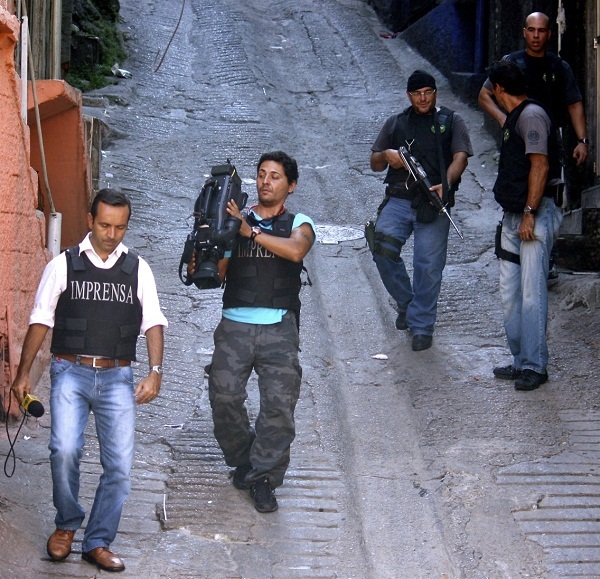 A year and a half later a citizen journalism platform called Viva Rocinha was founded during the November 2011 military occupation of Rocinha which paved the way for pacification. Fast forward another three years, a month before the World Cup kickoff, and Viva Rocinha has over 14,800 active members all sharing and commenting on community news as diverse as politics and protests, live updates on traffic congestion, missing persons reports, as well as cautious updates on the conduct of the “UPP” – Pacifying Police Units – who enforce the law in the Favela once the BOPE flush out the bandidos. 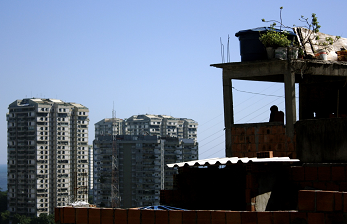 Chekhov: Is Rocinha safer since the UPP pacified the Favela? Michel Silva: I’d rather not answer. Chekhov Does Brazil’s mainstream media accurately report on the issues facing people living in Rio de Janeiro’s many Favelas? 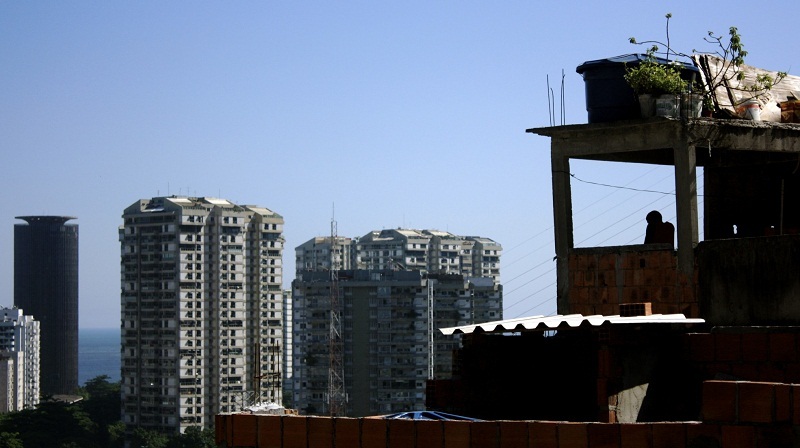 Chekhov: Can you tell us about the “Big Brother Rocinha” ? Michel Silva: “Big Brother Rocinha” emerged with the entrance of the UPP in Rocinha. There are 80 cameras scattered at strategic points in the community that monitor the streets and entrances to alleyways. They are used to reduce crime or monitor the movement of the police and residents. Chekhov: How have smartphones changed independent and citizen journalism inside Rocinha? Michel Silva: A citizen journalist can get lots of content using a smartphone. The new phones have changed our way of action in community journalism and now information arrives faster throughout the community. When I bought my first smartphone it was great because I could provide more info with speed and reliability. Chekhov: When you started Viva Rocinha at 18 years did you have any formal experience in journalism? Michel Silva: I’ve never had experience with formal journalism. I like reading the newspaper and admire journalism. I played an online game called Habbo, through this game I created a news site about this game for users. I created the site in 2008 and closed it in 2010. 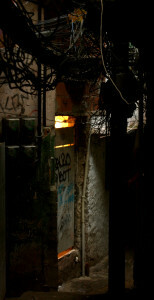 After that I studied about WordPress and Blogger and then had the idea of ​​creating Viva Rocinha in early 2011. 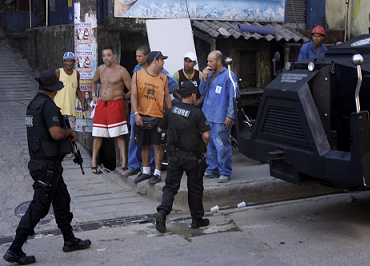 Viva Rocinha became active in late 2011 with the military intervention in Rocinha. Chekhov: Why is community important? 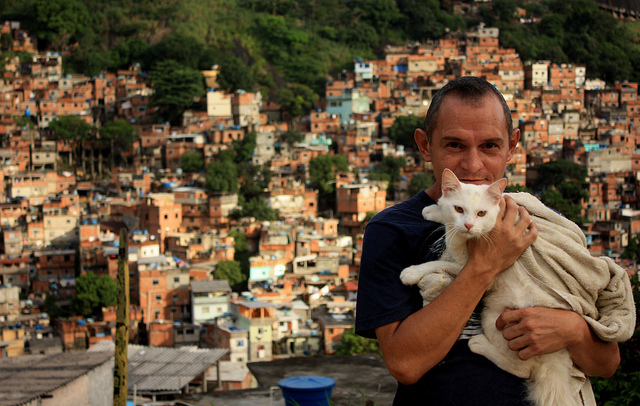 How does a community media page like Viva Rocinha empower a community? Michel Silva: I created Viva Rocinha in order to democratize access to information in the community. An efficient vehicle for communication didn’t exist in our community but with the popularization of the Internet in the Favela alternative journalism has grown significantly. 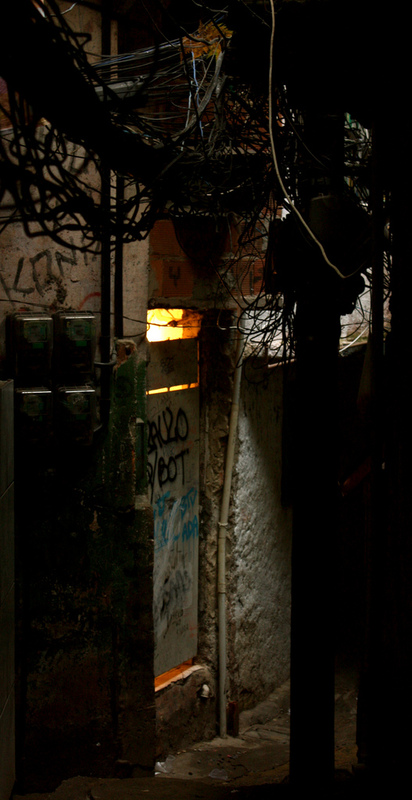 Today Viva Rocinha serves thousands of residents over the internet . Chekhov: Can you explain your first viral post on the 7th of may of a policeman using pepper spray on a dog and afterwards on a girl? Why is important to hold police accountable with community media? Michel Silva: The photo of police firing pepper spray into a dog was taken by a colleague Dominic Peixoto from newspaper O Globo. 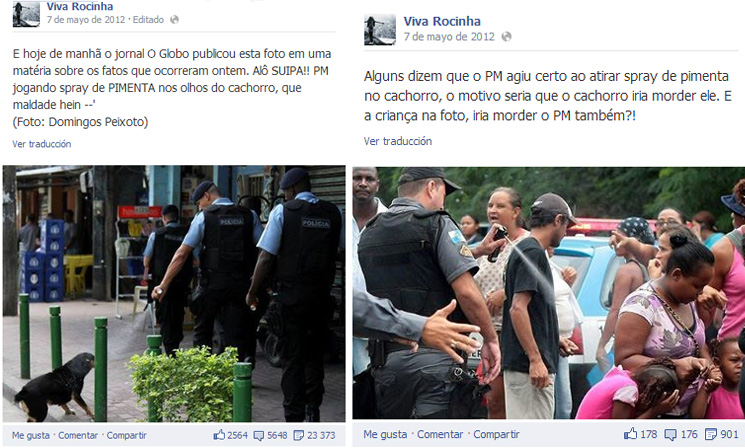 I was one of the first people who shared the photo on Viva Rocinha. After a few hours the photo had over 10 thousand likes on Facebook, 15,000 shares and thousands of comments. The repurcussions for this case was that this police officer was removed from the service. The photo of police firing pepper spray in the face of a girl was in another community. I don’t know who took the photo, but it also resonated. It shows that we have many untrained policemen. Chekhov: that is the power of citizen journalism. You can follow Viva Rocinha over Facebook and Twitter as well as their website Vivarocinha.org as Michel and Michele provide accurate news from Rocinha during the world cup.